With 2018 being Magic: The Gathering’s 25th anniversary, fans of the long-running game have been treated to a lot of new formats, products, and events. Some have been well received, such as the Dominaria expansion. Others have been more limited in their reach, like the Battlebond draft set. Magic Weekend is the in-store play equivalent to [the Battlebond or Conspiracy draft sets]. It’s our “innovation” event: a space for us to experiment, once per season, with new ideas, formats, and even prizes. The features will be new each time. For the Guilds of Ravnica (GRN) Magic Weekend that was held November 9–11, 2018, this took the form of a social event where players could participate by doing things like drafting from four-packs of GRN instead of three or playing a prewritten Dungeons & Dragons adventure that was designed and themed to the Ravnica plane and its attendant guilds. While the former is a type of draft that I’d never seen before, when I showed up at Dreamers Vault in Minneapolis during the event, it was the D&D one-shot adventure I was there to play. I arrived just before the start time and found the only other person who was there for D&D was dungeon master Gwen Carlson. A fellow Magic player, Carlson had volunteered to run the game for the store when she learned that no one there had plans to do it. She was handed the Wizards-provided materials not long after she arrived and was studying it with great intent. While she reviewed her notes, I looked down at the pregenerated character sheets to see exactly how Wizards was going to break down the Ravnican guild characteristics into archetypes that would work within the D&D mechanics. The biggest difference between making a regular 5th-edition character and making a Ravnica D&D character is that as part of character creation, you get to choose up to three NPC contacts to be part of your starting “equipment.” Two of these characters can be part of your guild (one as an ally and one as a rival), and one of them can be from a different guild as an ally. When we played the first-level adventure, “Krenko’s Way,” it was so very helpful for us to have among these contacts a Boros guild librarian who knew our Boros Legionnaire and helped us search the archives for more information about who might have helped bust the goblin gang leader out of incarceration. It also helped me flesh out my Simic hybrid character a bit more, so that she became more of a person rather than just a series of statistics on a sheet. The Contact character creation mechanic is not present in the Personality and Background chapter of the standard 5E Player’s Handbook; however, I’d love to see this kind of mechanic be added to a revised edition because of how useful it is when it comes to helping a player immerse themselves into a new character. The one-shot adventure was pretty average as far as the lore and storytelling. Just as in any other first-level D&D game between near-strangers, it took our three-person party a bit of time to find our groove with each other, especially since one player and the DM were familiar with the Ravnica plane and setting and the other two players were not. Soon, though, we were happily investigating, bantering, and infiltrating warehouses with the best of them. When it comes to the setting, I can’t think of any way to have made my D&D session more fun. Carlson noted that it was not like the last time Wizards mashed Magic together with D&D. “This feels different from the Zendikar one,” she said. “It’s being sold as a setting guide—someone who didn’t know Magic could run a Ravnica game. 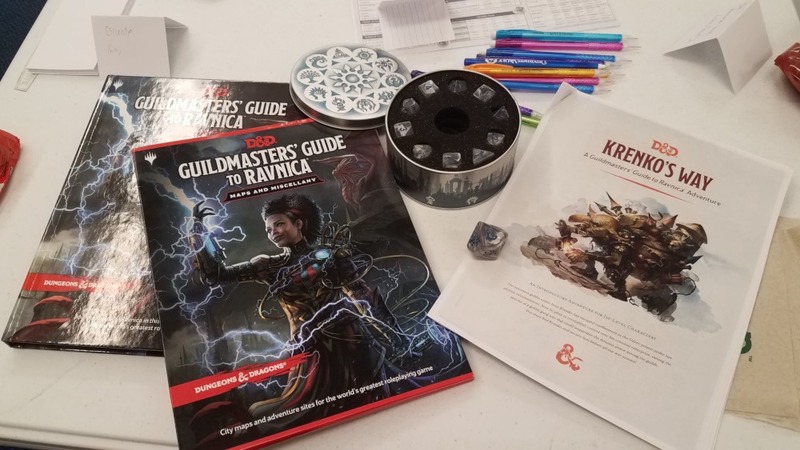 [The Guildmasters’ Guide to Ravnica] seems like it presents the setting comprehensively.” I felt very much the same, and Carlson’s familiarity with the setting was key when it came to describing the characteristics of the guild factions we’d chosen so that the other two players could play their roles more completely. We felt the store had not done enough to promote the event, as I was the only person who showed up to specifically play the Ravnica D&D adventure; the other two players had to be roped in by the store manager. Carlson said she had learned about it a month before on Facebook, which is when she volunteered, but she didn’t notice it being talked up within the store itself. As the volunteer DM, Carlson would have also liked more time to read the Wizards-provided materials, having only received them on the day of—which was when the store received them. Because the store was also holding GRN tournaments all day, the noise level made it hard to role-play effectively without shouting. At the same time, Carlson noted that having a smaller group of people at the table made it easier for her to run the game and keep track of everything that was going on as well as give her players a longer amount of time to linger on their decisions and perspective on the situation. It was not the only Magic-themed event that was happening that weekend, which may have split its intended audience’s attention. Dreamers Vault staff was also hosting a Star City Games Regional tournament in Bloomington, while the Guilds of Ravnica Pro Tour was taking place in Atlanta and streaming on Twitch. Along with the fact that there were Sealed, Draft, and Standard events going on in the store at the same time, this meant that there wasn’t enough random foot traffic around to entice people to play. The next Magic Weekend will be taking place on February 16–17, 2019 for Ravnica Allegiance, and all four Dreamers Vault locations will be among the Twin Cities stores holding Sealed, Draft, and Standard tournaments as well as showing up the second five Guild Kit packs and another D&D adventure. As much as I like to draft at Dreamers Vault, I do hope that I’ll be able to take Dr. Kosma Wyr out for a walk in the Ravnican streets again sometime soon. 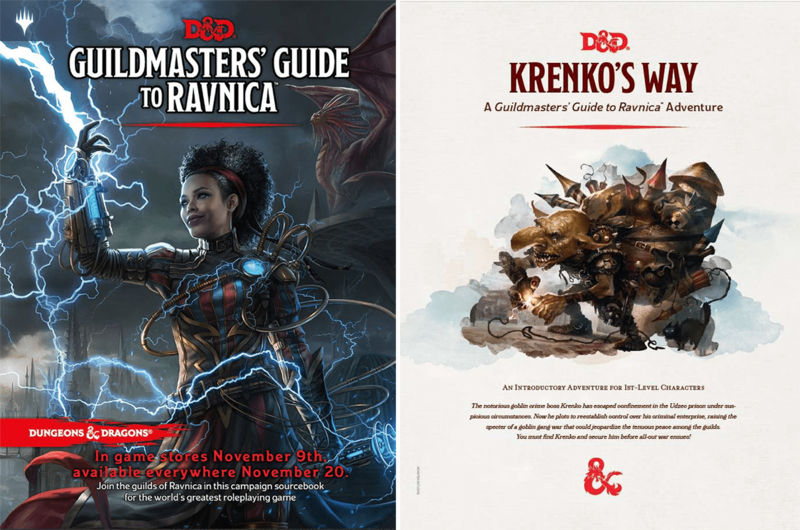 If you’re interested in running a Ravnica-themed role-playing adventure, an electronic version of the “Krenko’s Way” 5E module is available for $4.99 at the Dungeon Masters Guild website and the Roll20 Marketplace, while the entire Guildmasters’ Guide to Ravnica is available at both sites as well as Amazon, booksellers, and of course your friendly local game store.